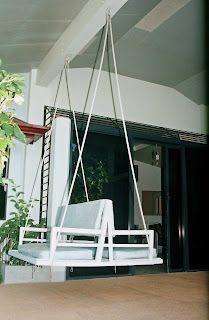 First item for our home makeover - our old wooden swing was replaced with a weatherproofed steel one. The back-to-back design hangs by square bars for max loadbearing. You could make one with a removable backrest for naps on the back porch.